Running can hurt. There is the infamous “side stitch” that that is a sharp, stabbing feeling just below the rib cage that can linger for minutes, or appear and disappear within seconds, neither scenario is pleasant. There is the all too familiar “sluggish/dead leg” sensation that can creep up at any time. It is that dragging cinder blocks as legs feeling that can set in early into a training cycle, or several years into a flourishing career, no runner is immune. Or, my favorite, that “Gumby-like” like feeling that overwhelms my body from head to toe in a quick rush making me feeling lightheaded and weak. Not fun. I am not a Magician, but I do possess the recipe for the mystical potion to cure these nagging, painful ailments, keep running. It is a simple, yet hard answer. Running is amazing. It can hurt, or rather, it does hurt, but it also empowers those who choose to take it on. I have been a runner since I was nine years old, and I have experienced every one of the afflictions mentioned above about a hundred thousand times, as well as fantastic moments during workouts and races that make the sticky parts a quick memory, but I have never experienced in the last thirty years what I did last Sunday, a nearly perfect run. I ran the San Diego Half marathon last Sunday, March, 10th. The date is significant, because on March 10th, 1990 was the greatest athletic achievement of my life. Yes, it even trumps qualifying for Kona. I was the goal keeper of the undefeated AYSO soccer team, the Super Charger’s, and we played the game of our lives that dreary day in Norco, CA. Honestly, I am not sure what level we had just surpassed, “Sectional, blah, blah,” we had been sailing through various play-off battles since November, but whatever it was, it was HUGE, and moved us on to compete against the best teams at state level. I had a pretty awesome game. I can’t remember if it was a shut-out, but I know I played well, I was caked in mud from head to toe by the end, (always a good sign for a goalie), and we won. From that day on March 10th, has been ingrained as a very important day, but I have never run a race on that day. 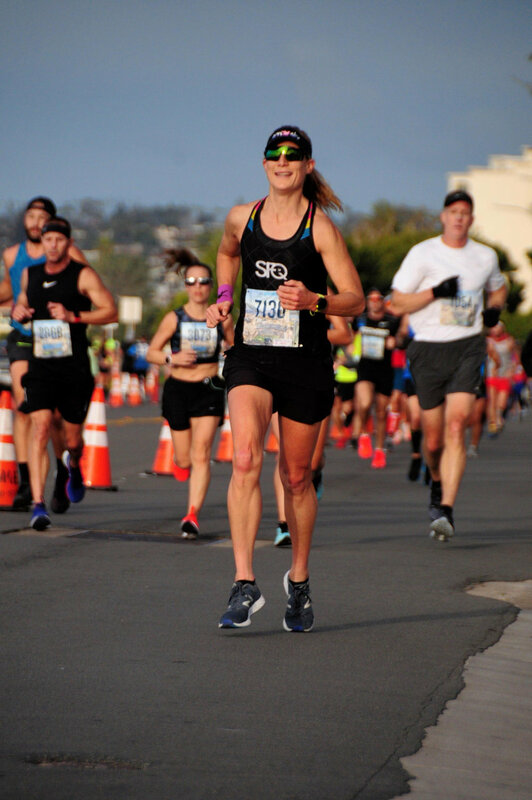 I ran the LA Marathon on March 11th and 12th, the Catalina marathon on March 17th, but the San Diego Half marathon was the first time a race fell on the March 10th. Which is why even though I was warned that the course was tough, meaning not a PR course, I still wanted to run it. I knew it was going to be a special day. I walked/jogged the mile and half to the starting line from our hotel in the still pitch dark pre-dawn hour of 6A, (which felt like 5A, because we had lost the hour to the time change), but I was wide awake. Most of Downtown San Diego was still sleeping, which made my solo jaunt special and only slightly scary. Soon I saw other early risers with bibs on their stomachs, and heard the hum of the starting line up ahead. The pre-race buzz was exciting, but organized, my favorite combination. I had plenty of time to drop off my gear, and find my spot squished near the start of the Wave 1 corral. En route I saw my Team SFQ teammate, Darlene, her team arm-warmer’s made her look like a super-hero, and made her stand out in the crowd, which was both an inspiring and comforting sight on race morning. My Team SFQ Teammate, and fellow runner, Darlene Savage. Photo Courtesy of Darlene. Before the starting horn bellowed over our heads, I felt my nerves stand up, a sure sign that I wasn’t just ready to run, but ready to race. Still cold enough for gloves. I went into this race with a different mindset than the two previous half marathons’ I ran this season, Surf City and Ventura. Those courses were fairly flat, and if it weren’t for annoying windy conditions at both races, probably would have produced record breaking times for me, on the other hand, this course was hilly. I was advised by my coach that the hills would appear later in the race, so I assumed the POV of a “fast marathoner vs. a decent half-marathoner,” right from the start. That meant running a slower, yet consistent pace of 6:45 – 6:50min. vs. 6:30 – 6:35min. mile, which hopefully would insure I had plenty of juice left when I hit the hills on the back third of the course. Also, who are kidding, I am a marathon runner through and through. I do not have the jolt-like speed of a half marathoner, but I can stride all day. Steady pace around mile 5. I ran the first seven miles within 6:46 – 6:54min. pace, which were along fast, flat sections close to the harbor, and sprinkled with short, poppy hills once we started to run inland. The terrain was varied, which made it fun, but it also provoked strategy. So, I ran the tangents, powered up and down the short hills forcefully, and opened up my stride on the straight-a-ways, chicking quite a few men in the process. There weren’t very many women around me; the fast ladies were way in front of me and the runners closer to my speed I clipped past between miles one and two. Then I saw the orange shorts. I sped up over mile eight, dropping down to 6:46, but that is when the real fun began. I saw a lilt-like runner about twenty yards ahead of me wearing blaring, neon orange shorts, and I made it my job to reel her in. I did. But then I looked up, and up, and up, the “hill” that gave this course a hilly reputation stretched out ahead of me forever. I couldn’t see the top. That’s never a good sign. That hill resembled more of a mountain, (that’s a little overdramatic), but it was much larger and longer than I anticipated, covering all of mile nine, and bled deeply into mile ten. My PR dreams were already really chucked out the window, but I still felt great, and embraced the integrity of the course, and inched up the hill as smartly as I could, knowing I would murder myself over the last couple of miles to try to make up some time. Near the top of the hill, relieved that “Orange Shorts” was safely behind me, two other women zoomed by me with ease. Well, one of them looked great, and left me in her dust, but the other, an impressive, yet gassed out runner, left herself vulnerable as my prey once we crested the hill, and I pulled ahead of her on the straight-a-way. With just over two miles to go, the road slowly dipping downward, I picked up my pace, dropping down to sub 7min. miles, hoping that maybe, just maybe I could still sneak across the finish line under 1:29 hours. I have never had more fun or felt so good running in my entire life. 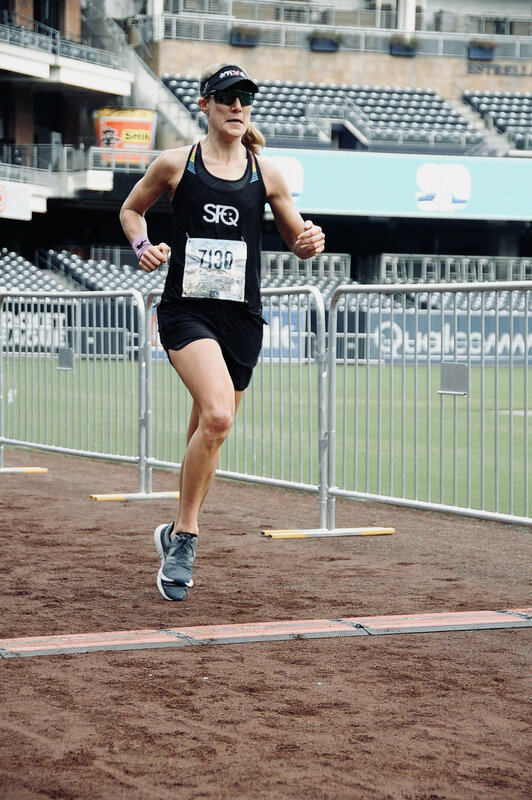 Yes, this section of the course was downhill, but I pushed hard every inch of the way, I was flying, and wished more than anything that I had another 13.1 miles left to run; I wanted more time to feel like this. Then I saw a flash of orange shoot by my right side. “Orange Shorts” was a real runner. I couldn’t catch her, but I tried, and in doing so clocked my fastest final miles of any race, ever, 6:35, 6:33, and even dropped down under a 6:00min. pace over the last few yards as we turned into Petco Park, (home of the Padres), and ran down the third base line to the finish. I had more energy when I finished than when I started, which was both invigorating and annoying. Obviously, that is not the point, I should have been spent at the end, but I ran that race like a marathoner, so in my mind, it ended halfway through. I ended up finishing in 1:32:11, not a PR, but the race as a whole was a definite breakthrough in my running confidence and a clear sign that my fitness is growing. I have had a blast running three half marathons in five weeks, but I can’t wait to sink my legs into the longer distances. However, the short fun is not over yet. Ironman Boulder is less than three months away, so close, but Ironman Oceanside 70.3 is next up on deck, and I am positive will serve as a healthy wake-up call to the triathlon season.